Procrastination is a habit common to many people. Surely you have catch yourself postpone important tasks again and again! Many people are shifting their activities as a way of life, but this can lead them to a dead end and unfulfilled goals. Procrastination is sometimes the reason to lose a professional opportunity or the deadline for your tax return! However, people are not born with procrastination! Often, the cause of the procrastination lies in childhood and the authoritative behavior of parents on their children. Many characterize it as a form of rebellion towards life. 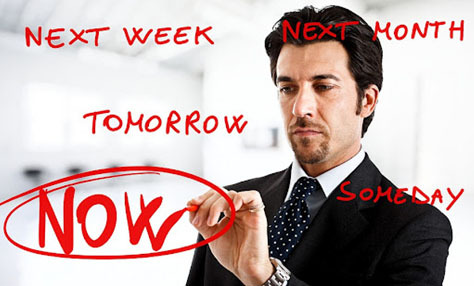 6 Ways to beat procrastination! The key is to control and fight all the excuses and avoiding phrases like: “It is better to do this job tomorrow” or “I will postpone this for another day”. If you are honest with yourself, you can more easily beat procrastination. If you are one of those people who choose to perform the most trivial tasks instead of the mandatory, if you make regular breaks while at work for a cup of coffee or postpone an obligation until the time is ‘right’, then “yes” you are suffering from procrastination! Sure, occasionally can happen to anyone but always having excuses for avoiding an obligation is not the normal. Remember, the more you stop procrastinating, the more likely you are to beat this habit for good! The reasons for procrastinating at work depend on both you and the nature of your work. Sometimes you find excuses or may be reluctant to work at normal pace and leave several obligations that could be completed today, for the next day. This is normal since most jobs have boring aspects and we often choose to dedicate our time to the most pleasant tasks. What you can do to remove procrastination at work is apply time management techniques and other methods that can help you set your priorities correctly. People who set priorities, timelines and lists can perform their work more efficiently without procrastination. Instead, people who are not organized operate in a completely different manner. Procrastination is more than a habit, its addiction! One of the ways to beat the addiction of procrastination is to create your own “rewards” for a job. For example, promise yourself that you will fulfill a wish if you finish your work. For the more laborious, it is good to ask a friend to put pressure on you to run more consistently. At the same time, keep a list of your tasks and organize them according to priorities and time limits. Another useful technique is to “break” a job into smaller tasks so that it’s easier to perform. Start with small and quick tasks and later deal with bigger and more time consuming jobs. At the end you will realize that the outcome of your work was much more effective than other times. If course, your obligation is something important, put in the front of your mind the consequences from your procrastination. 4. Find your productivity time. We all have certain hours of the day, when we are more productive. You can create the list depending on your psychology at the time. For example, if you sleep late, you can schedule some of your obligations for the evening. In this way your job will be much more pleasant than doing it the hours you feel bored. 5. Reward yourself for your consistency! The society is “designed” to work with the logic of rewards and punishments. Your personal motives should not be far from this technique. Reward yourself for a job and you will be able to gradually clear your procrastination. Find out what can motivate you to accomplish even the most boring tasks and consistently push yourself towards this direction. Publish your goals, intentions on your personal blog or communicate them to other people. This is a technique that can guarantee results because of possible public embarrassment in the near future. Let’s say that you intend to write a book by a certain date. If you publish your goals, then it’s another source of motivation to achieve them so as to avoid having to give excuses in case of failure. This will ensure that even under pressure you will achieve your goal.